Touring is for me not only eco-friendly but also a way to fully enjoy every step towards a summit not to mention the descent. A dream destination for all backcountry skiers, as the area provides all sorts of adventures. It is especially well known fot its high jagged peaks and fjord skiing. Summit-to-sea is possible in the right weather conditions and offers a great view of the fjords. The peaks are around 1500 meters over the sea and propose all levels of skiing. The True Home of Ski Lovers, has the most beautiful skiing to offer. Located in the south of Laponia the snow conditions are often as good as in Japan and the magical Northern lights make it a place you do not want to miss. As the roads are few the perfect combination with snowmobile and touring makes this place a skiing paradise. You won’t forget the champagne powder once skiing it. We climb up the mountain by our own, therefore it’s good to be in shape and you will enjoy your stay a lot more. You will also need to be experienced in off piste skiing. Groups can be of up to 4 people, if you are alone but want to ski in group this can be made possible, just let me know when booking. Sunnmøre: take a flight directly to Ørsta-Volda flygplats and then rent a car in Volda. You can also rent a car directly in Oslo or I can pick you up at the airport in Oslo or Volda. 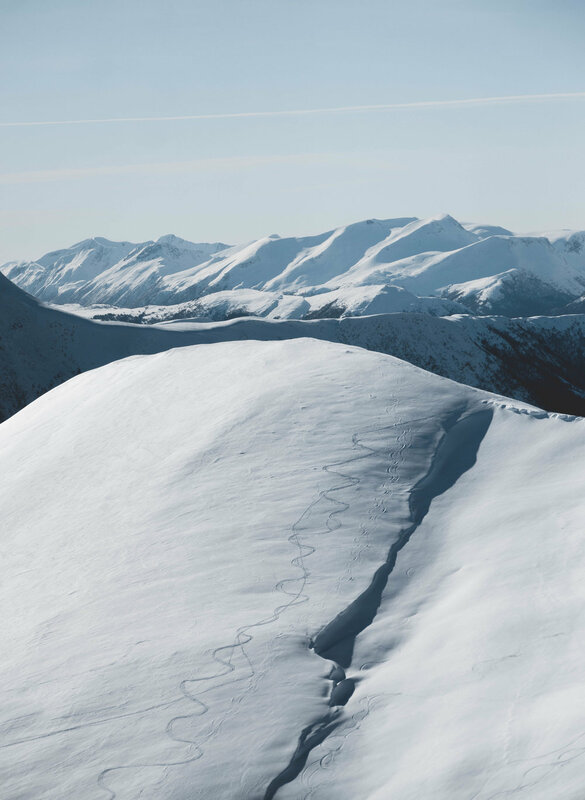 Kittelfjäll: the nearest airport is Vilhelmina or book your transport with Active Ski by bus, you can also travel by train from Stockholm or Malmö with Inlandsbanan. The accommodations are plenty – from luxury hotels, cottages and tents to snow caves. Keep in mind that digging a snow cave can take up to 3 hours but the comfort is remarkable and it will be a night to remember. You will need avalanche equipment (transceiver/probe/shovel) and touring skis, renting is possible on place. If you have an airbag backpack please remember to contact your airline that you will bring your cartridge on the flight. You will need an insurance to cover injuries while off piste skiing. Available from October to May depending on snow conditions. Please inform me of your expectations and I will see to it that the trip is arranged after your demands. If you have any questions drop me a line by using the contact link below.